This is the tutorial I shared over at The CSI Project last week...just thought I'd share it with you too! Now on to the tutorial...I absolutely LOVE the 4th of July. I have had this idea for quite awhile but finally got around to it for this tutorial. Here are a few things that inspired me for this project, check them out here and here. 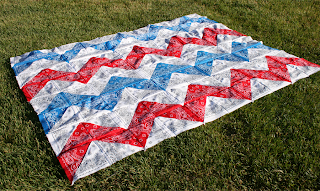 This project can have multiple uses but the two I think are best are either a table cloth or a quilt top for a picnic blanket. As a table cloth you could use it as is, or buy a lined table cloth and sew this one on top of it. As for the quilt top you'd just need to add a back and batting. Something fun about this project is that you could use any color bandana and use it at a birthday party. How cute would pink, yellow & orange be? 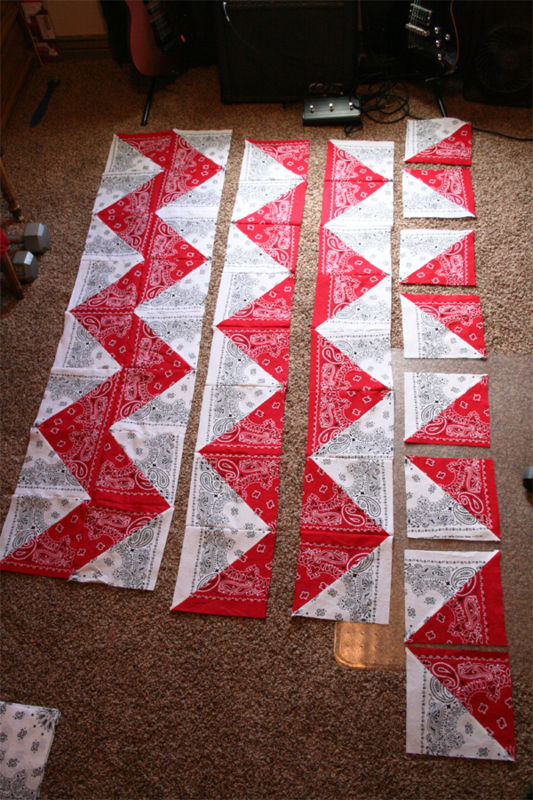 Or just red and white for a cowboy themed party? The possibilities are endless! Here's what you'll need for the red, white & blue version of this table cloth/quilt top. Step 1. Wash and dry your bandanas, be sure NOT to put the red or blue with the white, they bleed quite a bit. The bandanas shrink into a rectangle, which is kindof a pain, but you'll be so glad you washed them beforehand. Step 2. 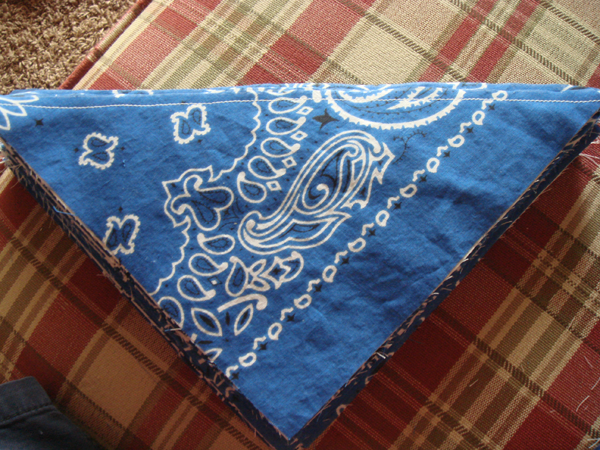 Square up your bandanas, I cut about 1"-2" off mine after ironing them which made them a 19x19" square. Step 3. Cut your 19x19" squares into four, each should measure 9.5x9.5". Step 4. 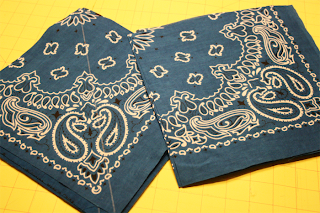 Draw a line diagonally from corner to corner using a washable marker/ fabric pen on the WRONG side of the colored (reds & blues) bandanas. Step 5. 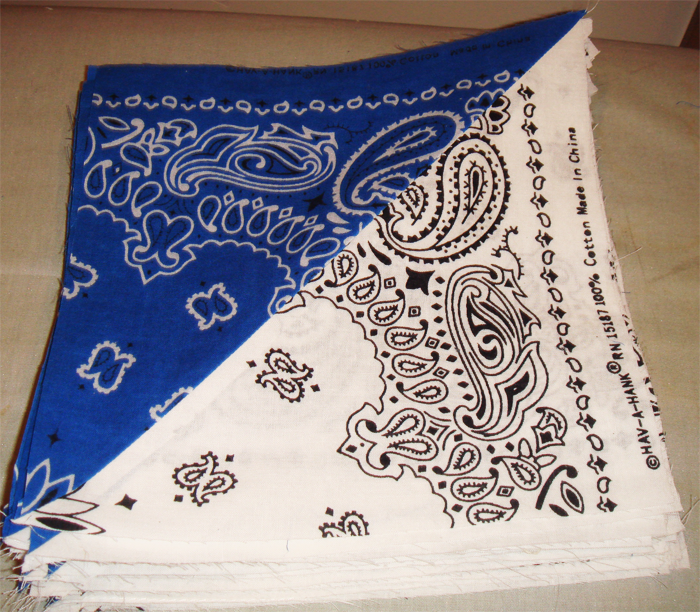 Match up a white bandana with each colored bandana with right sides together. You'll want to make sure the patterns match up like the picture. Step 6. 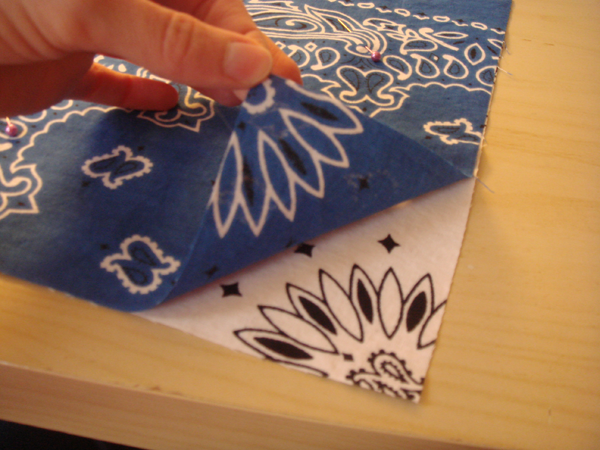 Line your presser foot up with the diagonal line and sew down each side. Step 7. 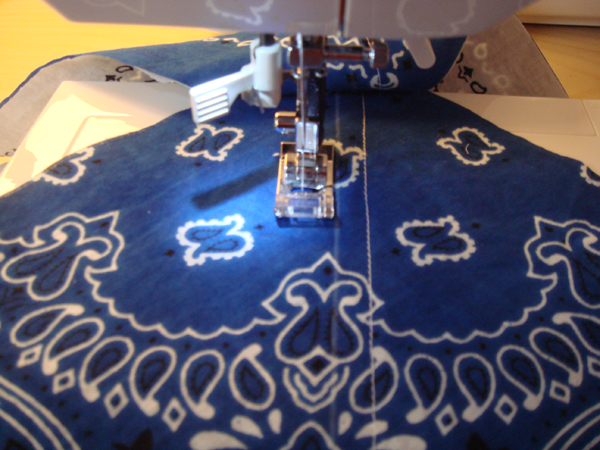 Clip your ends off and cut down the middle of each one on the line you drew. You will now have a lovely pile of triangles. Step 8. Iron each one with the seam open. See how cute it is with the patterns matching up in the middle!?! Step 9. 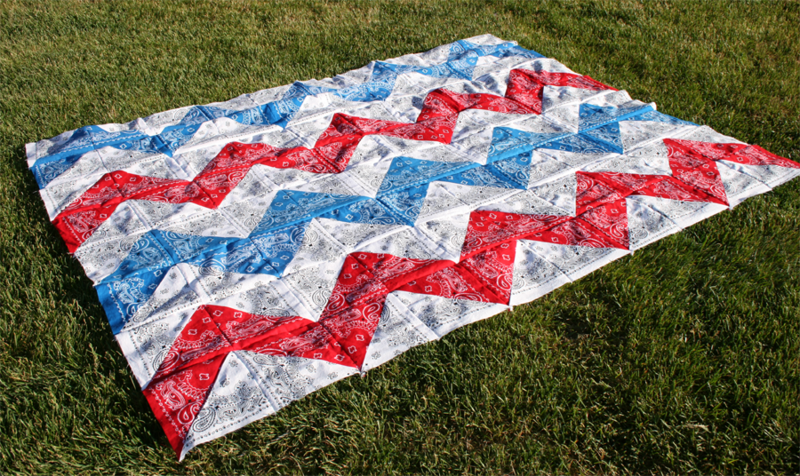 Lay them out in a zig zag pattern. 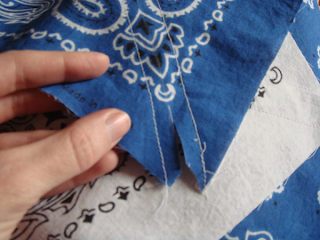 Sew each one together to make several rows. Then sew your rows together. The row on the right shows it laid out, the middle two rows are each sewn and the far left section shows 2 rows sewn together. Step 10. 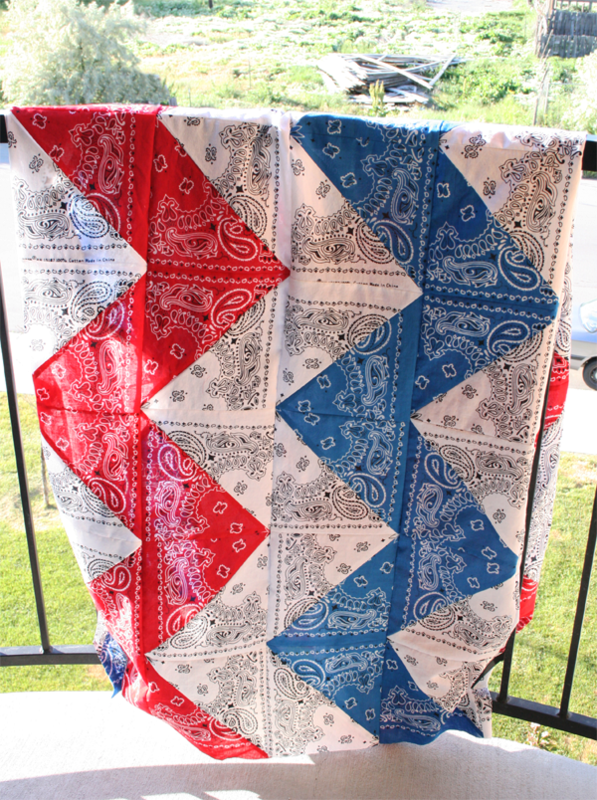 Iron it nice and flat and admire your adorable 4th of July table cloth or quilt top.